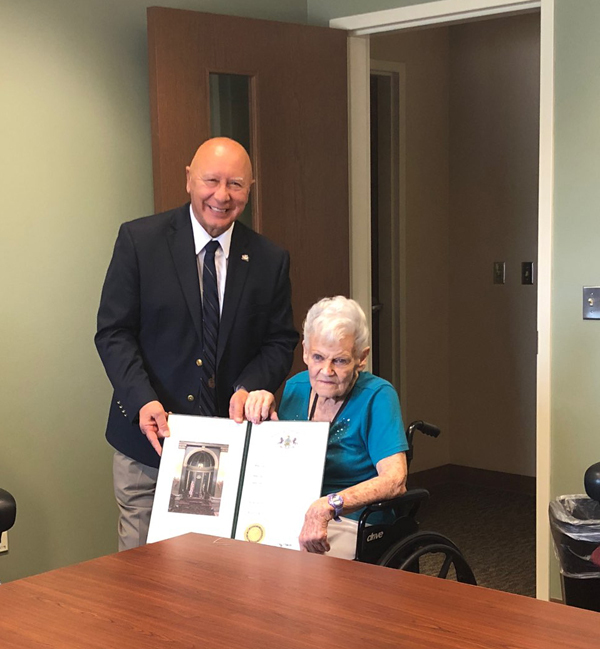 This week Winifred Below was recognized for her 25 years of volunteer service with her local church and volunteerism with Pocono Mountain School District. She has sewn many items that have been donated to those in need, including students at Swiftwater Elementary School. Despite her wheelchair, at 93 years young, Winifred has not let that hold her back – she has still come to the Elementary Center to help the teachers, read to students and assist nursing staff. Thank you for all you have done to serve our community, Winifred. 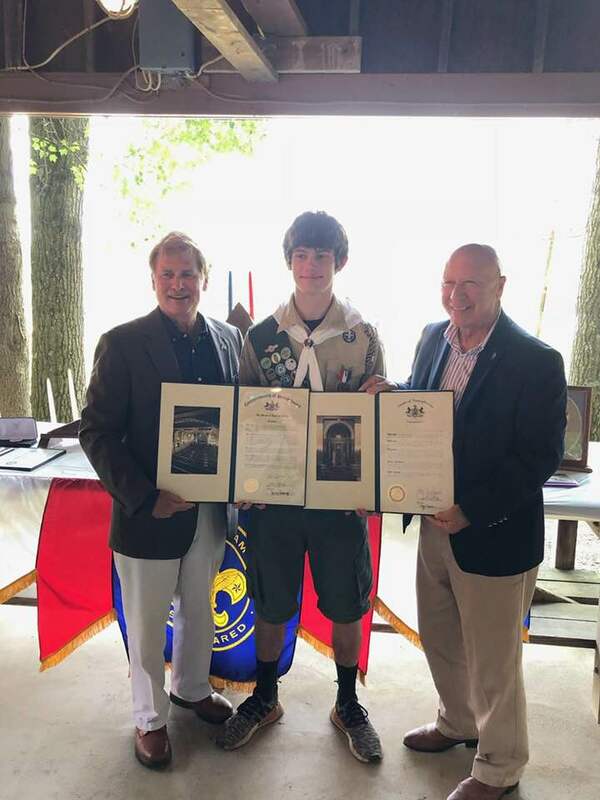 Congratulations to two of our newest Eagle Scouts – Zachary Brown of Troop 89 in Barrett Township and Christopher Acconzo of Troop 98 in Brodheadsville. 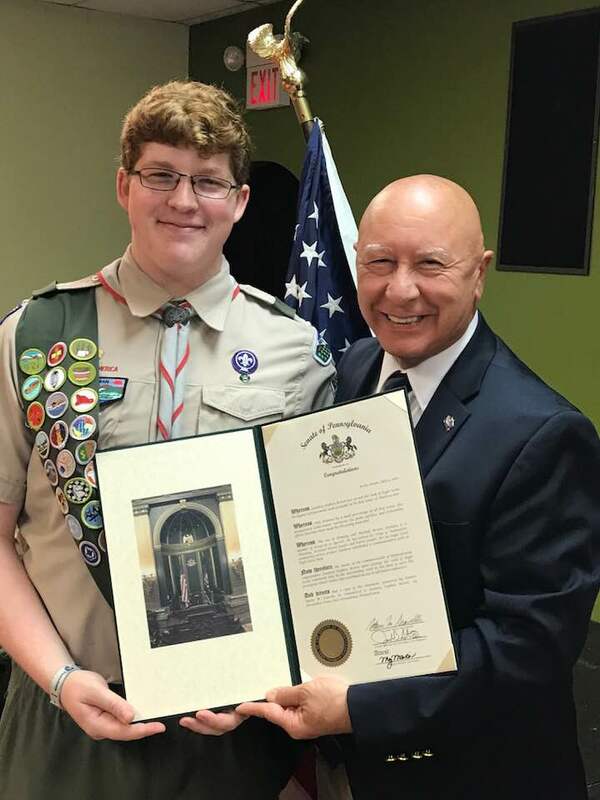 For their Eagle Scout projects, Zachary refurbished a commemorative path at High Acres Park and Christopher restored a trail at Polk Township Park by clearing debris, laying stone, rebuilding two bridges and constructing a sitting bench. Thank you both for your service to our community and for undertaking these outdoor projects that provide further recreation opportunities for our area residents. I wish you both all the best in all that you do! We had an outstanding turnout at my annual Senior Expo this year, co-hosted by State Rep. Rosemary Brown and State Rep. Jack Rader. Each year gets better and better as we include more exhibitors and state agencies who have a wealth of information helpful to area seniors. I want to thank Good Shepherd Rehabilitation and the PA Office of Attorney General for their informational presentations and Pocono Mountain School District for the use of their facility year after year. If you have not yet come out to an Expo, I encourage you to stay tuned for next year’s event in July! Tune in to my live Tele Town Hall on Monday, July 30 from 6 p.m. to 7 p.m. as we discuss a host of state issues, including the status of my school property tax elimination legislation. Residents of the 40th Senatorial District can register for the event here. 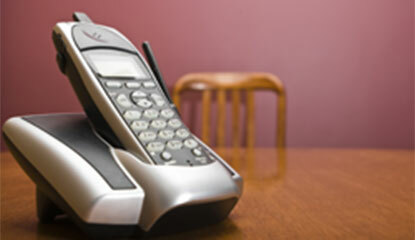 If you enter your phone number, you will receive a call inviting you to join the town hall. The tele town hall format encourages constituents to participate in a discussion on issues without the need to travel throughout the region. Participants can ask questions or simply remain on the line to listen to the discussion. The event will also feature a live audio stream page that allows smartphone, tablet and computer users to listen in and submit questions online. National Insurance Crime Bureau, using figures from the FBI, reports the rate of car theft in 2017 was up 4.1 percent from 2016, continuing a three-year upward trend totaling an 11 percent increase since hitting a 23-year low in 2014. The advent of “smart keys” and keyless ignition starting in 1997 has helped reduce theft, but these safety devices are useless if the keys are left in the vehicle, or if the vehicle is left running and unattended, such as while the driver makes a quick stop at a convenience store. Here are some tips to avoid making your vehicle an easy target. The Bridge Fencing Safety Act is now law, establishing requirements for when PennDOT must install protective fencing along state-owned bridges. Act 65 of 2018 also requires fencing on bridges where instances of suicide or attempted suicide have occurred. The bill was introduced at the request of Randy Budd, husband of Sharon Budd of Uniontown, Ohio. In 2014, the Budd family was traveling on Interstate 80 in Union County when a rock was dropped from an overpass, seriously wounding Sharon Budd. Children who are victims of violent crime, or who lose their parents as the result of a violent crime, may be eligible for additional educational support from the Commonwealth. Act 42 of 2018 expands the First Chance Trust Fund, which was created last year to help the children of incarcerated parents. The First Chance Trust Fund is administered by the Pennsylvania Commission on Crime and Delinquency and is designed to provide enhanced opportunities to at-risk youth through scholarships to students and grants to programs in areas with high dropout rates, incarceration rates or crime rates. Newly enacted Act 76 of 2018 allows a broader array of treatment options by marriage & family therapists, social workers and professional counselors. It better defines who may call themselves a “licensed professional” and provides new consumer protections. This law will bring Pennsylvania up to national standards by adding practice protection and diagnosis for clinical social work. Currently, 48 states have similar practice protection.